I struggle with keeping my scrapbooks current. I don't feel like I have to scrapbook everything but I have a huge pile of pictures I *want* to scrapbook and always seem to find something else to do instead. Scrapbooking is harder for me than card making and mini albums. I know that cards I send out are not going to be looked at for years to come. 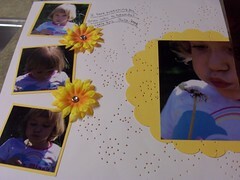 My scrapbooks are eventually going to the kids and they will (hopefully) look at and cherish them for years to come. In an effort to keep up and tackle that stack of photos that taunts me on my desk I am setting a goal of a layout a week. On to this week's layout. These are pictures I took while on our trip to Missouri. I actually remembered this time to use the macro function and take a nice close up ( I just love pictures that are really close up). I can't believe there are no patterned papers on this page! I used white and yellow cardstock. The piercing was done using the Bazzil stiching templates and my new Making Memories piercer and stylus combo tool. I'm not sure what kind of flowers I used. My local store, Felicia's Scrapbooks has a bin of random flowers that I pulled these out of and added the gem brads to the center. Croquet is the name of the game! Is it really summer here? ?